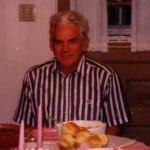 Everyone has had a favorite relative, and mine was my Uncle Merle Gray. In his younger days he kept us amused on the softball field at family reunions. This ended when he fractured his leg in an attempt to “hit it out of the park” in the late 1970’s. Later, he rehearsed his trucker jokes on my brothers and me at other family get-togethers. I’d drive two hours to his home Butler County, PA, just to listen to his memories of growing up in Western Pennsylvania. In many ways he reminds me of another of my heroes, the late Johnny Cash, legendary American singer and storyteller. More about that later, but after so many years of hearing Uncle Merle’s tales, this article is my humble effort to tell his. From his birth on February 24, 1927, until the mid-1930’s, this seventh of twelve children of Paul Barton and Bertha Ione Gray lived in a modest but sturdy red brick house that his father had built in the predominantly Scotch-Irish West Deer Township, Allegheny County, PA. [See “A Letter to the Editor” for his concise autobiography.] When the family moved to a small farm in Middlesex Township, Butler County, he continued his education in the Mars School District. But his young life consisted of more than school. As Johnny Cash did when his family moved to a new farm at about the same time (Turner, The Man Called Cash, p. 19), one of the first things Merle had to do was to help his father clear scrub brush from the land. They had a team of mules named Amos and Andy to do the pulling, but Merle had to get in under the white thorn bushes to attach the chain, and that wasn’t much fun. Also at home, there were other animals and crops to care for and new brothers and sisters arriving regularly. [See “Memories of My Mother Ruth”.] In about the eighth grade he began working for a neighborhood farmer, Dale Hall, for $20 a month. He had to walk from the farm to the Walters’ Dance Hall to catch a bus to Mars High School. Before long he moved to the Glen Allen Farm where his pay increased to $30 per month. Merle loved to brag that when it came to drive legally, he got both his learner’s permit and his license on the same day. You see, he had been studying his older brother’s manual and so that on his 16th birthday he went to Butler and came home with this rare accomplishment. Needless to say, the officers and his family were amazed. But, as intelligent and hard-working as he was, he never finished high school. Later that year, 1943, he hitchhiked to California. His father had done this at age 18. He rented an ocean front room at Hermosa Beach for $7 a week and began working for Harvill Aircraft, a wartime industry. Before long, he found himself working as a rodman on a survey team for an oil company in the western states of California, Wyoming, Utah, New Mexico, and Texas. On February 23, 1945, after having lived and worked in Texas earning $125 a month and returning home to Western Pennsylvania, he enlisted in the United States Marine Corps. He says he didn’t want to be drafted when he turned 18, but his parents wouldn’t sign the permission papers to sign up early. So, he enlisted anyway and became one of four U.S. Marines in that family. He began in the infantry and had hoped to join the motor pool like his brother Barton. He said his feet bothered him. Advancement never came because the war ended with the armistice in November, 1945. Returning home and picking up where he had left off as a civilian, Merle hitch-hiked to Iowa to be with a girl he had met through her sister while working at Glenshaw Glass before the war. The 15-year old beauty was visiting other family there. On his way home he says he remembers it snowing between Youngstown, Ohio, and New Castle, PA, until it came up to his knees. He married that girl a short time later. He was with her until his death after almost 7 decades. Her name was Elizabeth Margaret Meinert, but everyone knows her as just “Betty.” They borrowed a relative’s 1940 Plymouth to get around, but blew up the engine. The young couple paid just $60 a month for room and board with Betty’s parents from 1945 until 48. Merle worked with her father at the Isabella Company for 62 cents an hour. The next year Merle began with Carnegie-Illinois Steel, now part of U.S. Steel Corporation, unloading coke with a steam crane along the Allegheny River in Etna. He worked seven years there. Before the age of electric furnaces, industry used this “charred” coal to heat a mixture of iron ore, limestone, and scrap metal to make steel. Merle remembered the dark cloud that hung over the city 24 hours a day and hot dirty water that flowed past the Point, downtown. All that changed in the ‘50s as Pittsburgh experienced a renaissance of commerce and technology. But, that meant that some people lost their jobs, and Merle was one of them. In 1954 he took a new job as a deck hand for Captain Griffith on a steam-powered riverboat run by Marine Ways. The tug could push six barges at a time from the Rabena Mines, supposedly the largest mining complex in the world in those days. Each floating container was 26 X 17 X 8-feet, weighed 6,000 tons, and could carry 36,000 tons of coal per day, mostly to electric generating station up and down the Ohio and Mississippi Rivers. Merle normally worked for ten straight days and then enjoyed five off. His shift was six hours on and six off. He loved his job and said, “The president of the United States never ate better.” His duties? As the boat neared a dock or lock, the captain would blow the whistle, and with two giant ropes on his shoulders, he had to be ready to tie off the boat and the barges. Not only was this hard work, but it was dangerous too. One false step and he could end up in the icy water or crushed between the vessels. But always the optimist, Merle remembered with a smile the good times. While the riverboat was cruising to its destination, he could rest. He said the original steam engine was so relaxing, but when diesel motors came along, they shook the whole structure and he couldn’t get much sleep. My income doubled as I went on the road driving. All seven of us got two and three trips a week: Boston; New York; Perth Amboy, NJ; Baltimore; and Detroit. After four years and 400,000 miles, I ordered a new Autocar from A.R.Boarts in Butler. I found out I could more than double my income again by owning my own tractor instead of just driving someone else’s. I leased on with Daniels’ Motor Freight out of Warren, Ohio, one of the oldest trucking companies in the eastern United States. I earned 25 cents per mile. That was 12 cents driver’s pay and 13 cents as the owner of the tractor. Daniels paid all highway taxes and tolls, state license, a fuel allowance of 15 ½ cents per gallon plus tires and oil. The big engine took 44 quarts every time I changed oil. I pulled their trailers from terminal to terminal. They had interstate commerce rights for all states and cities from the Mississippi River east and the Ohio River north and east to the St. Lawrence. That included New York, New Jersey, Pennsylvania, Maryland, West Virginia, Ohio, Michigan, Indiana, Illinois, and Wisconsin. Merle belonged to the International Brotherhood of Teamsters. He paid $7 per month dues while the company contributed weekly to the health, welfare, and pension fund. Jimmie Hoffa was the union president at the time. He mysteriously disappeared in 1975. 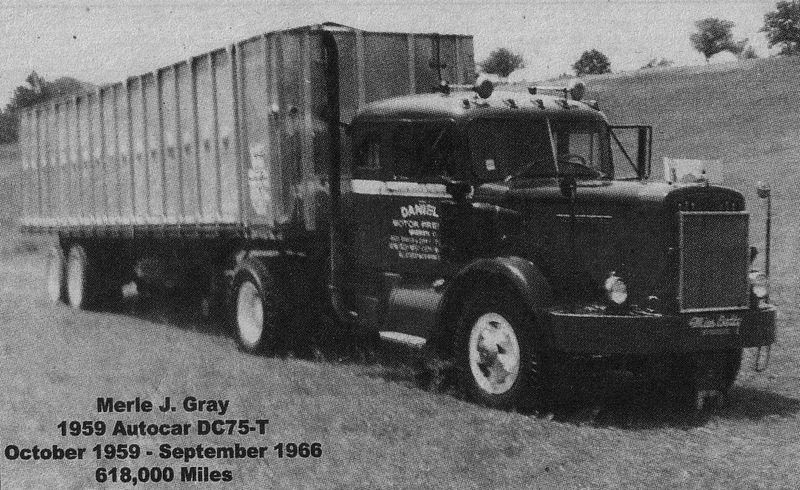 “I had pretty good trucking until October 30, 1967, when the big green ‘E’ took Daniels over,” said Merle. Eazor Express, of Pittsburgh, was one of the top 10 freight companies in the eastern United States. He continued, “A lot of drastic changes took place! We who had our own tractors had to buy our own trailers. Big change in pay too, for the better! Seventy-five percent commission on the gross pay of the load. But backtracking a bit in our story, in 1948, after living with Betty’s parents for three years, the couple moved into a very nice little home one-half mile west of Route 8 on a beautiful hillside along Rt. 228. Merle had gotten three acres from his father, a carpenter, and together they constructed the one and one-half story, 28 X 30-foot wood frame house. Betty and Merle raised three sons and a daughter there. [See their descendants to follow.] In 1971 they added on, resulting in one and one-third more living space (4,300 sq. ft.). The garden was a pleasure, but with all the grass to mow and more house to clean, the couple began looking for another place. In 1997 they sold out, 49 ½ years after they had moved in. They relocated eight miles north toward Butler, again just west off Route 8, this time into a quaint 1300 sq. ft. red brick ranch on three-quarters of an acre. The house was 2 ½ miles south of the county seat on Marshall Drive. Around the beautifully manicured front lawn Merle has tulips, roses, and other flowers in season. The almost level lot has a large garden in the back where Merle cultivated asparagus, rhubarb, potatoes, corn, and many other vegetables. Toward the end of his life, he and Betty moved one more time, south, still in Butler County, to a townhome near the new Mars High School. Closer to their doctors, their church, and many stores, the beautiful one-story abode is in a development with several dear friends. Merle was able to stay active and continue his hobby of raising flowers. Family was important to this couple. Proud to mention his Gray family’s recent 50th reunion held at the East Union Presbyterian Church near Cheswick, PA, Merle and Betty have attended nearly every celebration. Most of his relatives are buried there or at the nearby Bull Creek Presbyterian. At his death on July 23 of 2013, Merle had been the oldest member of the Glade Run United Presbyterian Church in Cooperstown. He had joined with his brother Bob as teenagers 73 years earlier. It has been said that Merle’s Great-great grandfather James helped construct Glade Run’s original log building in 1812. 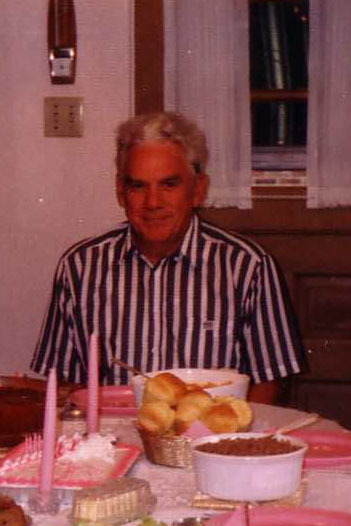 Merle served as a trustee and Sunday School teacher. The sanctuary was filled at his memorial service and he was laid to rest by family and friends from around the country in the church cemetery. In conclusion, I treasure the times and memories I was able to share with my favorite uncle over the years, and especially in writing this piece. Like Johnny Cash, Merle had both good times and bad, but he was never afraid of hard work. And like any good storyteller, he was on the road a lot. After his retirement from trucking, Merle said, “I have been desperately trying to make up for the 52 years I spent away from Betty, out on the road half to two-thirds of each week. But it just is never going to happen. I would love to spend another lifetime with my Betty.” They were married for 68 years. I enjoyed reading this. My dad was born in McCandless Twp and grew up mostly in Allison Park, although he had relatives all through West Deer Township. Some of the roadways are still named after our families there, the Sterlings and the McIntyres. These two families sent 5 or 6 off to war during the Civil War, at least one never returned, and one other returned but never got back on his feet. I am very interested in researching whatever drew Scots-Irish to that area to begin with, and how they arrived, whether they came together or separately, if anyone knows. Jim, I’m familiar with the Keil name; in fact, one of your elders just passed last year – almost 100! Although my Pearces were English and came to north Pittsburgh comparatively late (1820), our Scots-Irish first settled down East (Chester, Adams Counties, etc.) before buying up and farming the Depreciation Lands first offered to the Revolutionary War soldiers. I’m convinced many knew each other before coming to the Pennsylvania frontier, even back in Ulster. I’m writing about old George Allison of Allison Park even as we speak. Thanks for your interest.